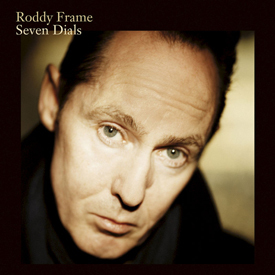 While leaving a gap of 8 years since his last release is all very commendable, it is also very frustrating, as Roddy Frame was (and indeed still is) one of Britain’s finest songwriters and musicians. In fact, I wish I had a pound for every band I’ve seen that owes a massive debt to his original band Aztec Camera; yet he doesn’t get the praise his undoubted talent deserves. SEVEN DIALS opens with the poetic White Pony which is instantly recognisable as a Frame song, with luscious yet simple arrangements that date back decades but sounds right up to date. Presumably Roddy Frame has spent the last twenty years living a very simple life in a Scottish castle drinking nothing but Highland water and eating a macro-biotic haggis diet because his voice sounds as warm and clear as when I first heard it 30 years ago (and I don’t think that is down to Pro-Tools! ); and fans will be pleased to ear this his guitar playing is as exquisite and understated as ever on every track; with some flourishes that are genuinely breathtaking. I’m not very good at finding hidden meanings in songs; always taking them at face value so I think there’s been some recent heartbreak in Roddy’s life as the love songs here are all bitter-sweet with Rear View Mirror and the harmonica laced Forty Days of Rain certainly feel that way; even if they are sung to his trademark jaunty beat. The same theme runs through the final track From a Train; although this time he sounds very melancholy as if he realises where the fault for the break up lies and it’s not with the lady looking back from a train window. There’s absolutely nothing new here for long term fans; not that they would want Disco re-mixes anyway. SEVEN DIALS is song-writing, singing, musicianship and production at it’s very best and even has the capacity to win him a legion of new fans across the World if he can be bothered to actually promote this thing of beauty. My copy came with a six track live CD from a concert at Buxton Opera House in 2007, featuring one of the finest songs that I’ve ever heard – Reason for Living, trust me it’s nearly worth buying to hear this particular version alone.